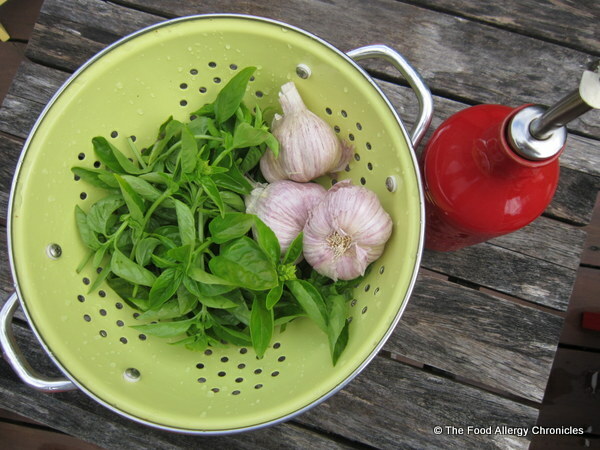 Posted on September 17, 2012 by Susan H.
As our summer season is coming to a an end, it’s time to think about what to do with my basil, parsley, chives and oregano growing in the garden. It’s so hard to say goodbye to fresh herbs at my ‘fingertips’, but I know if I don’t use them up…Dear Mr. Frost will be here before I know it. What does one do with it all? I have yet to find a store-bought pesto that does not contain either dairy/tree nuts. The combination of my boys’ food allergies…dairy/peanut/tree nut allergies…purchasing a pesto has never been an option. Luckily, creating a pesto is a breeze. This post is dedicated to basil. I have both green and purple basil growing in my garden. 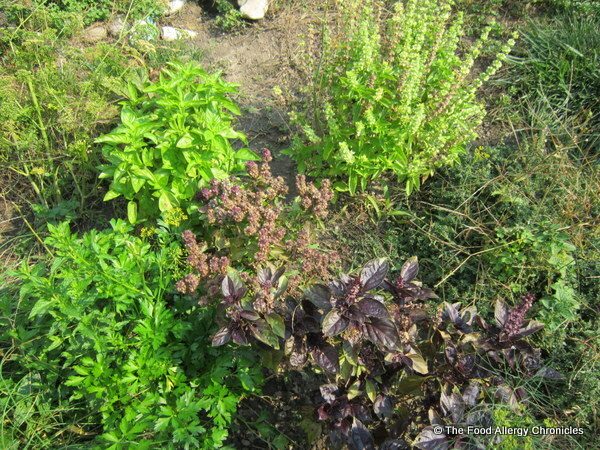 I love to decorate with the purple basil…it looks so pretty tossed amongst the ‘greens’ in a salad. Basil and pasta seem to compliment each other, therefore, I paired my basil pesto with spaghetinni…yummy! This weekend, the boys, along with their friend William, volunteered their Saturday (8 am- 3:30 pm) at our church’s ‘2012 Taste Festival’. They were in charge of setting up, manning the drinks table, and clean-up. They each earned 7 1/2 hrs towards their 40 hr volunteer requirement, required by the time they graduate from high school! Perfect! As the boys would not be able to sample any of the wonderful food that was represented by the many cultures that make up our church…Africa, India, West Indian, Latin America, Italian, Trinidad and the Philippines…I brought over their lunch. Michael literally ‘wolfed down’ the Dairy and Peanut/Tree Nut Free Basil Pesto Spaghetinni and Dairy and Peanut/Tree Nut Free Parsley and Chive Pesto Baby Potatoes I packaged in his thermos…declaring them both delicious. He barely had any room for his slice of Dairy, Egg, Soy and Peanut/Tree Nut Free Banana Cake and pear. Measure above ingredients (except oil and pasta) into a food processor. Pulse a few times to blend. Boil spaghettini until al dente (check box for directions). Drain…do not rinse. Immediately, a tablespoon at a time, add the Basil Pesto and toss to coat. 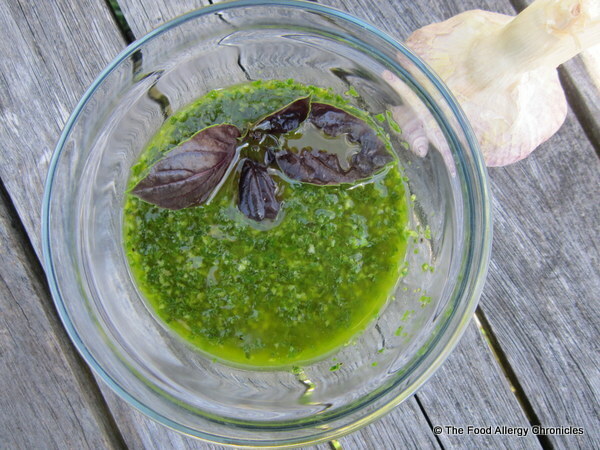 The amount of Dairy and Peanut/Tree Nut Free Basil Pesto will depend upon your preferred taste. Saturday night, Andy and I enjoyed our Dairy and Peanut/Tree Nut Free Basil Pesto Spaghetinni with some roasted shrimp with hot pepper flakes. Yummy! Tip 1: My neighbour likes to dip his basil leaves in olive oil, stack them and freeze. Has anyone tried that method? How do you save your garden basil? Tip 2: Store any leftover Dairy and Peanut/Tree Nut Free Basil Pesto in a covered container in the fridge or freeze in an ice-cube tray to defrost for a quick ‘hit of summer’ during the winter season. P.S. I am thinking a slice of toasted Dairy, Egg, Soy and Peanut/Tree Nut Free French Stick spread with some Dairy and Peanut/Tree Nut Free Basil Pesto topped with a cherry tomato would be worth a try! Any other ideas? P.P.S. I will be posting my recipe for Dairy and Peanut/Tree Nut Free Parsley and Chive Pesto Potatoes on Wednesday. 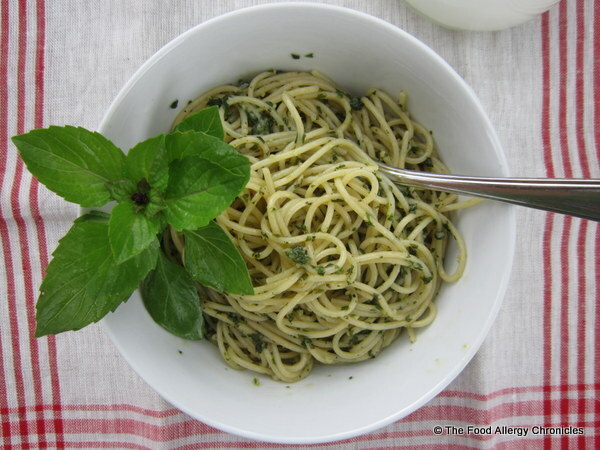 This entry was posted in dairy free, dinner, lunch, multiple food allergies, peanut/tree nut free, side dish and tagged Dairy and Peanut/Tree Nut Free Basil Pest Spaghetinni, Dairy and Peanut/Tree Nut Free Basil Pesto, Smart Catelli Pasta, Smart Catelli Spaghetinni by Susan H.. Bookmark the permalink. Spreading pesto on a mild tasting fish fillet makes for a tasty and fast dinner main course. I freeze my pesto in ice-cube containers but have begun to freeze them with only a quarter of oil recommended in the instructions I use. Adding the oil when the cubes are thawed makes them taste even fresher for some reason. The same applies to the parmiggiano cheese, ( I know you don’t use this ingredient) but adding it when thawed gives the pesto a fresher taste, and I find the colour is brighter as well. Great tips…thanks! Pesto as a condiment on fish is a favourite of mine! Especially with fresh coriander mixed with a few spices! It’s always ‘hit or miss’ with our vegetable garden. There was just one parsley and basil that were really worth saving. We are enjoying the pestos so much…there may not be much left to freeze! In Canada, Anaphylaxis Canada lists pine nuts as one of the common tree nuts. Coconut and nutmeg are not on the list, however, they can cause an allergic reaction. It is best to consult one’s allergist to test their safety. Thanks for the queston! Glad for the question. I had no idea that pine nuts are edible seeds from pine trees! I can see how it would be confusing to know if pine nuts were considered a tree nut….which they are in Canada. I have always avoided them with my boys…better to be on the safe side.